These instructions take you through the proccess of making a Dyneema® (Cuben Fiber) stuff sack using our DIY Kit. The sack starts off as a rectangular piece of Dyneema®. The material is folded and joined using transfer tape to produce the stuff sack. No sewing is required! You can make your stuff sacks any size you’d like by using the formula below. We’ve also included the dimensions used to make YAMA’s standard size flat sacks. Mini 5" 6" 10.5” 7.5” 34.5"
Small 6" 8" 12.5” 9.5” 40.5"
Medium 8" 10" 16.5” 11.5” 50.5"
Large 10" 14" 20.5” 15.5” 62.5"
Cutting Dyneema® can be difficult. You’ll want either a good pair of scissors, or a razor blade and surface on which to cut. When cutting with scissors, it works best to slide the scissors through the material as soon as you get the cut started. Seams on the stuff sacks are taped using a 1/2” transfer tape. Transfer tape leaves behind a film of pressure sensitive adhesive when the backing is removed. 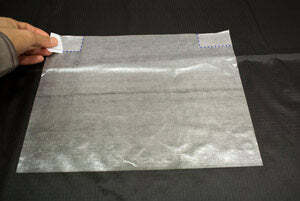 Unlike double sided tape, no carrier material is present in the finished seam, only adhesive. YAMA Mountain Gear makes these materials available for your personal use only; they may not be reproduced or distributed. Any commercial use is prohibited. The instructions and patterns are believed to be accurate, but YAMA Mountain Gear assumes no liability whatsoever with respect to the use of the materials and goods developed from the materials. Use the following recommended layouts to make efficient use of your material. Orient the rectangle so the long edge is horizontal. This will become the width of the sack. Place one of the rectangular stickers at each top corner so the long side is horizontal. Factoid: This sticker reinforces the drawcord opening to help it last longer. It’s not needed on the smaller size sacks as there’s less abrasion from the drawcord on those sizes. At the top corners, mark points 1-1/2” from the corner. Cut a piece of transfer tape, 2-1/2” long. At one of your marked corners, imagine a diagonal line between the two points you marked. Align the tape with this line so the tape sits above the line. Remove the dull sided tape backing, and place the tape. Rub off the adhesive from the exposed ends of the tape and press it down well. 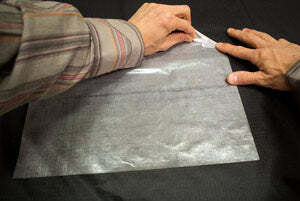 Fold the Cuben along the tape edge as shown, then unfold it. Remove the tape backing, fold over, and press down. Repeat this the steps shown in photos 4 thru 6 at the other top corner. Cut and place a strip of tape along the top edge with the folded corners. Rub off the adhesive from the exposed ends and press down the tape. 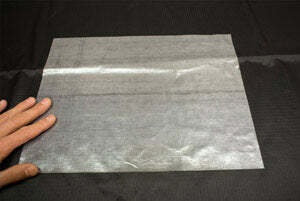 Also rub off any adhesive from parts of the tape that overhang the cuben edge. Firmly press down the tape. Using your fingernail may work well. Tip: In general, after you place any tape, you’ll want to rub off all exposed adhesive before removing the last layer of tape backing. And always press the tape firmly after it’s in place. Cut a piece of drawcord about 10" longer than the top edge (the edge with the folded corners). Singe the ends with a lighter to keep them from fraying. Lay the drawcord along the inner edge of the tape. Factoid: We supply spectra cord not only because it’s lightweight, but also because its slipperiness minimizes wear and tear on the drawcord channel. Fold the taped edge over the drawcord to create the drawcord channel. The channel should be about 1/4" wide to allow the drawcord to slide freely inside. Keeping the edge folded over, remove the tape backing and press the seam down. Note: The side facing up at this point is what will be the inside of the stuff sack. Flip over the stuff sack so the outside is facing up. Fold the Cuben along its height so the vertical edges are offset by ½”, (to match the width of the tape), and so the longer half is the lower layer. The outside faces should be facing inward towards each other. Cut a piece of tape slightly longer than the bottom edge. Place the tape along the bottom edge. Position the tape so that one end is lined up with the cut corner and the excess runs out past the fold. 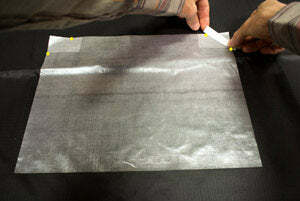 While keeping the Cuben folded, rub off adhesive from the excess tape. Press down the tape firmly. Reverse the previous fold so that the sack is right side out. Make sure to retain the 1/2” offset. Orient the sack with the vertical cut edges to the right. The longer bottom edge should be on top. The tape should now be sandwiched between the Cuben. Keeping the stuff sack folded, pull the backing out and press the pieces together. Flip the stuff sack over so the vertical cut edges are to the left. Place a strip of tape on the bottom edge. Rub off excess adhesive and press. 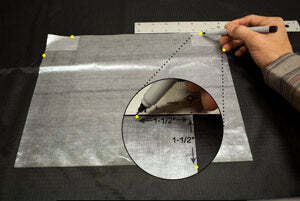 Fold the bottom edge along the tape and remove the tape backing as you press it down. Two cut edges now remain with the one on the bottom extending about 1/2" past the one on top. Run a piece of tape along the edge of the bottom piece, rub off excess adhesive, and press it down. Fold over the taped edge to enclose the other raw edge. Remove the tape backing as you press down the seam. Place one of the circular stickers at the drawcord end of the the seam that you just finished. Center it on the edge of the seam, just below the drawcord channel openings. On Large size sacks, repeat this on the inside of the stuff sack. Install a cord lock on the drawcord. Tie a knot at the end of the cord. Finished - Do a dance!